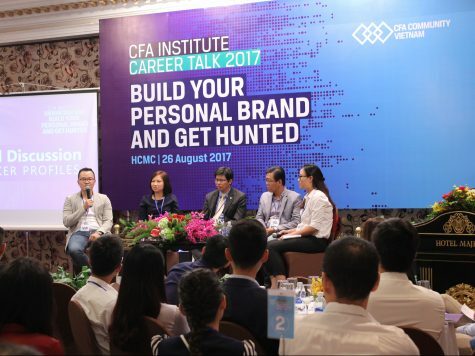 On August 26th, CFA Institute and CFA Community Vietnam organized a series of career talks in both Hanoi and Ho Chi Minh City. 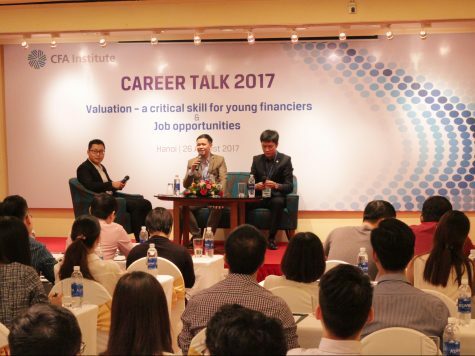 These are among the many annual events of CFA Community Vietnam to support young finance professionals on career development and advancement. The career events Valuation – A Critical Skill for Young Financiers & Job Opportunities in Hanoi and Build Your Personal Brand and Get Hunted in Ho Chi Minh City offers young finance professionals valuable dialogues with leading industry experts for insightful advices on career advancement, recruitment trends, and professional network development. In Hanoi, Valuation – A Critical Skill for Young Financiers & Job Opportunities was organized at Nikko Hanoi Hotel, attracting more than 100 attendants, mostly with 1-3 years of work experience. The speakers also addressed other concerns from the participants in relation to valuation as well as jobs in the finance industry. 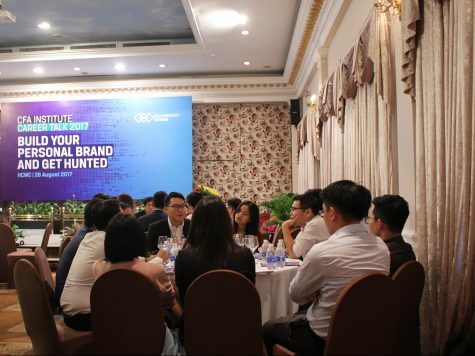 On the same afternoon, the HCMC Career Talk 2017 Build Your Personal Brand and Get Hunted at Majestic Saigon Hotel welcomed nearly 80 participants, many of whom have stepped up the finance and investment ladder. Eight speakers and mentors in diverse finance verticals including commercial banking, investment banking, corporate finance and portfolio management, shared their experience and different perspectives on how to position themselves in a competitive market, build a good personal brand, plan an effective career path and improve skills to advance to management level. “Personal branding is generally a new concept in Vietnam, and particularly in the financial sector. To maximize the benefit of personal brands in job hunting, young professionals should take a proactive approach, starting with discovering their own strengths, formulating a plan to develop strengths into a well-known brand and stay ready for any opportunity to come.” said speaker Mr. Ngo The Trieu, CFA, Chief Investment Officer of Eastspring Investments Vietnam. The 2017 Career Talks have attracted significant attention from finance professionals in both cities. By connecting industry veterans with young professionals and by delivering meaningful and practical content, the CFA Institute and the CFA Community Vietnam hope to assist finance professionals in pursuing their career goals and overcoming challenges. 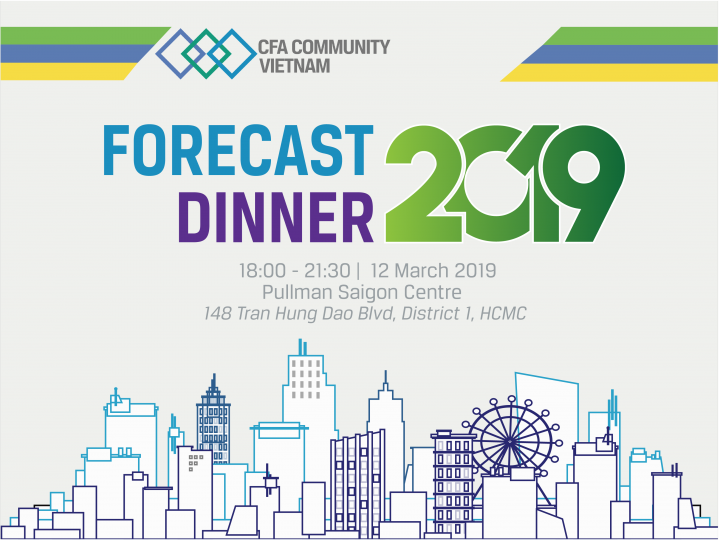 Vietnam Forecast Dinner 2018 panelists are renowned regional chief economists, portfolio managers, advisors and thought leaders.